The Thargoids still aren't interested in a fight. 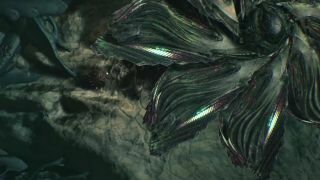 The encounter is triggered on planets, near alien structures, and if you're lucky/unlucky enough to find yourself staring up a Thargoid ship, here's what will happen: your ship will be disabled, and briefly commandeered, and the alien vessel will then proceed to hit the xeno-structure with a big wobbly line of energy. It'll then scan you a bit, and then eventually let you go. In the video, Mass_Locked Mafia breaks free and attempts to attack the Thargoid ship, but doesn't make a dent. The Thargoids aren't interested in a fight...yet.